At Kramerbooks and Afterwords Cafe, an indie bookstore in D.C. which is especially close to my heart, for it’s the site of one of my first dates with my wife! 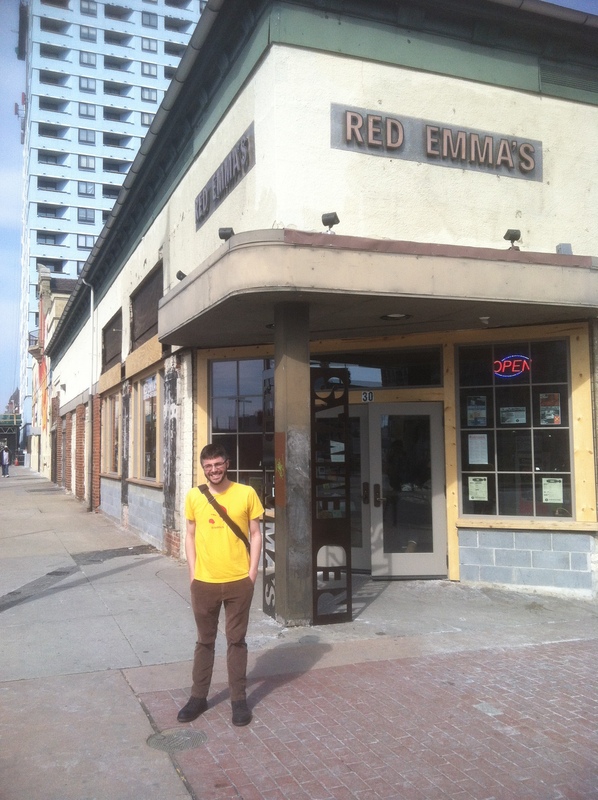 Kramerbooks houses the bibliophile’s trinity: books, brunch, and beer. 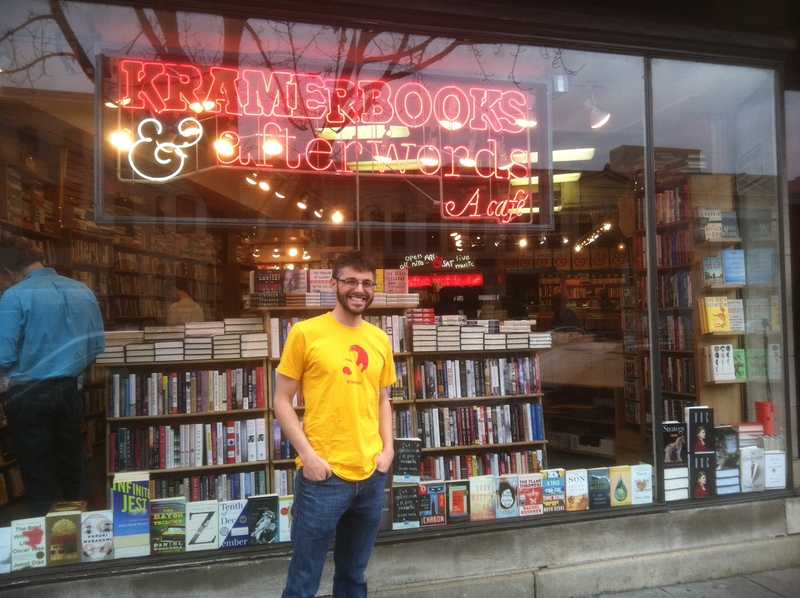 If you’re in Dupont Circle on a Saturday (be it 3 PM or 3 AM – it’s open either way), step inside Kramer’s and enjoy! 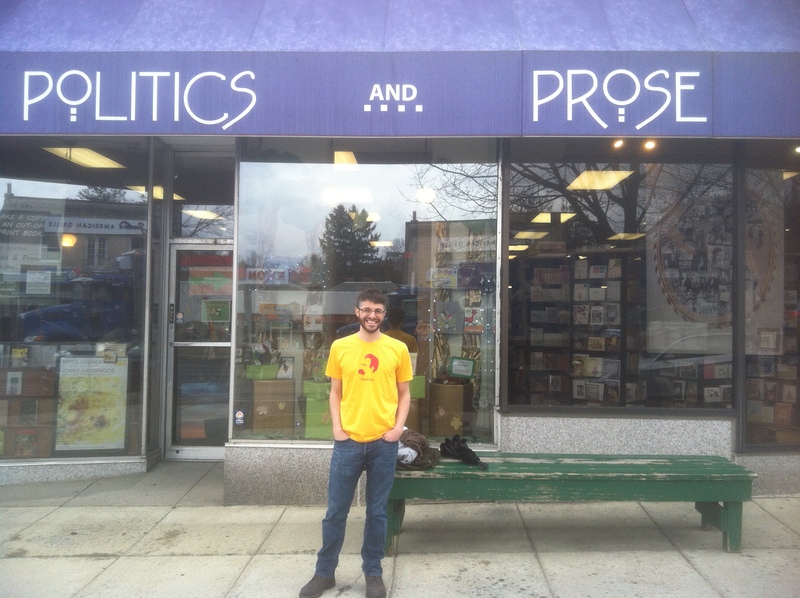 Posing in front of the entrance to Politics and Prose, one of the premier indie bookstores of D.C., a wonderful venue which offers a bustling schedule of events which would keep even an overachiever like Hermione Granger blissfully busy. I attended my first reading as an undergraduate at Politics and Prose, and, well, the place has stuck with me ever since. If you’re in D.C., make the walk down Nebraska or Connecticut and give it a visit! Making a pit stop at Atomic Books, which is an awesome indie bookstore in Baltimore with a graphic novel/genre slant: i.e., one of those establishments which sport Walking Dead comics, Game of Thrones Mugs, and Haruki Murakami novels side-by-side. What more could you want?? 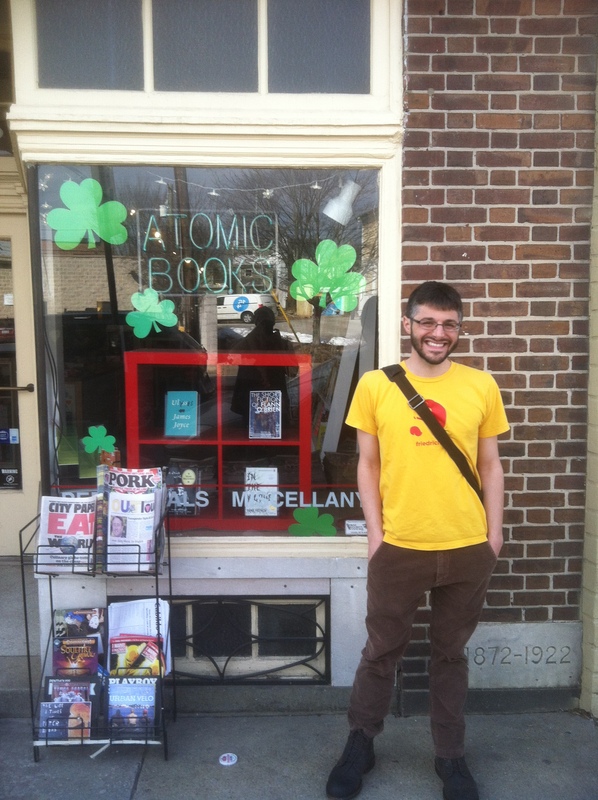 If you’re in Baltimore, give Atomic Books a visit! 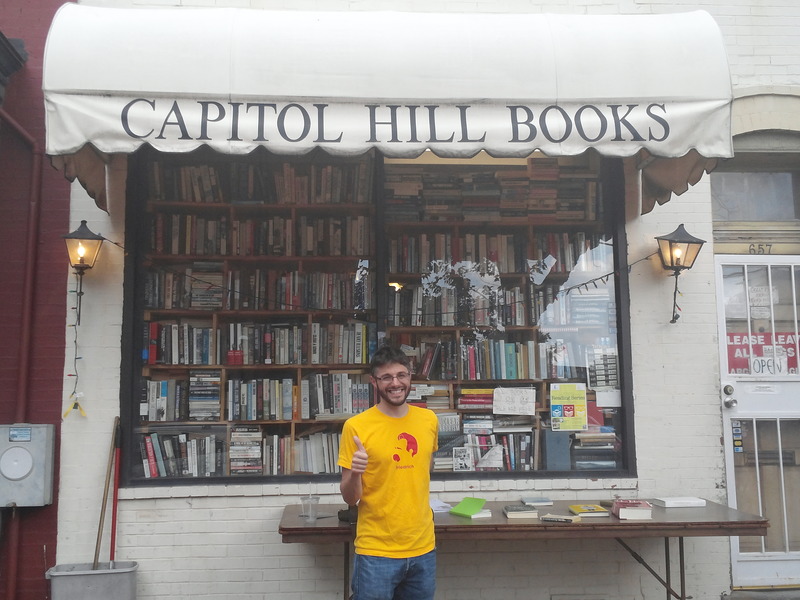 Giving a thumbs up in front of Capitol Hill Books, a wonderfully unique bookstore which resembles a mad librarian’s cluttered laboratory! If you’re in D.C.’s Eastern Market area, don’t pass up the opportunity to hit up this indie used bookstore: every inch of the establishment (including the bathroom) is cluttered with books in a cozy claustrophobic sort of way. At Busboys and Poets, a fantastic local bookstore/eatery in D.C. which gets it’s name from the fact that Langston Hughes once worked in D.C. for a time as a busboy before (well, you know) becoming a poet. 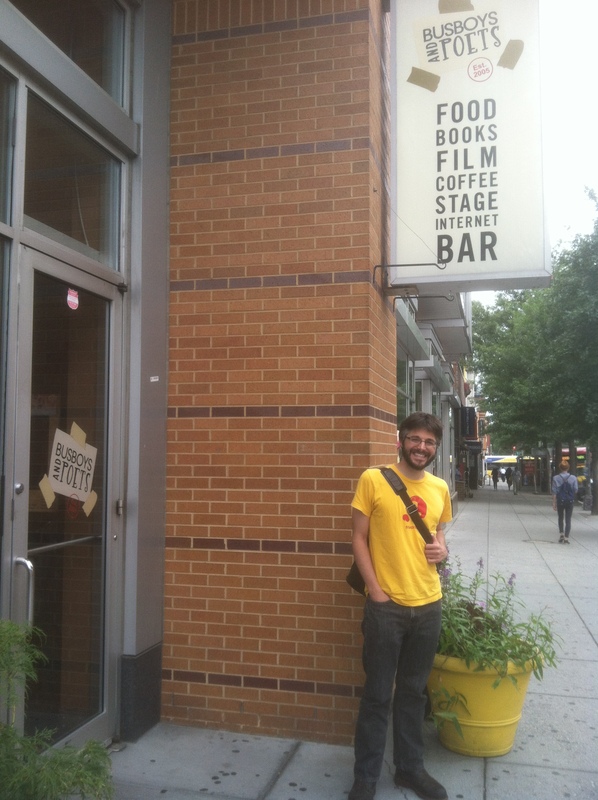 The venue is incredibly supportive and affordable – if you’re around 14th Street, check it out! The Strand Bookstore in New York is a mammoth nook, a cozy labyrinth, a sprawling wonder that hints at what it must have been like to enter one of the annexes to the library of Alexandria. 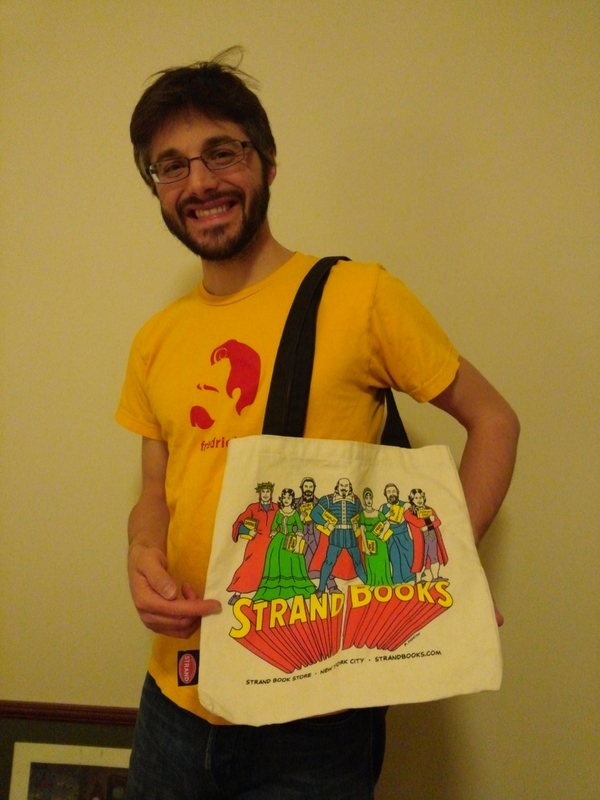 In this picture (sorry, haven’t been to NYC in a while), I’m sporting one of The Strand’s numerous tote-bags, which depicts the author’s version of “The Justice League.” If you’re in NYC, spend a few hours getting lost in The Strand – you won’t be disappointed! 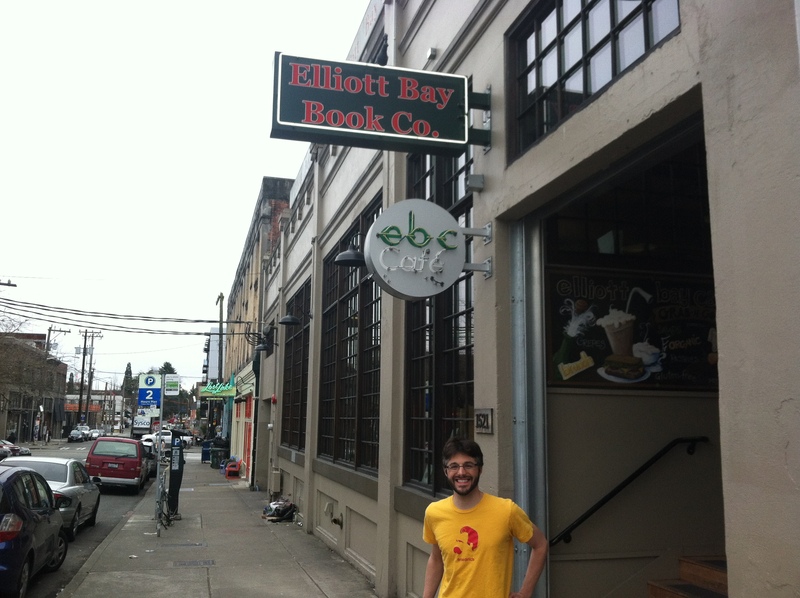 At The Elliott Bay Book Company in Seattle, an awesome venue with an equally awesome staff! Far off my beaten path, but makes me wish I lived in Seattle. If you’re on the West Coast, give it a visit! 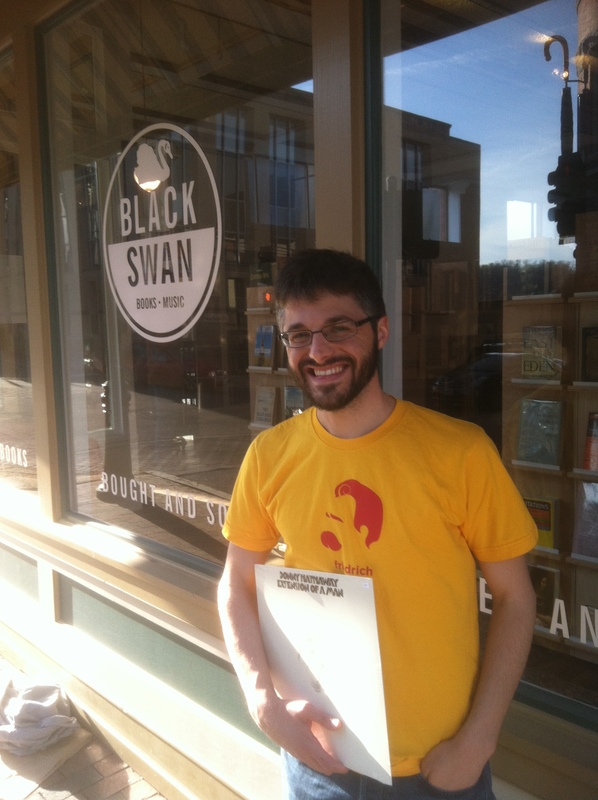 Buying a record from Black Swan Books and Music, an indie bookstore in Staunton, Virginia which combines a quality selection of literature (rare books in particular) with some awesome albums (e.g., the record in my hands: Donny Hathaway’s last album Extension of a Man). If you’re in Staunton visiting the Blackfriars Playhouse, take some time after the show to peruse the Black Swan! 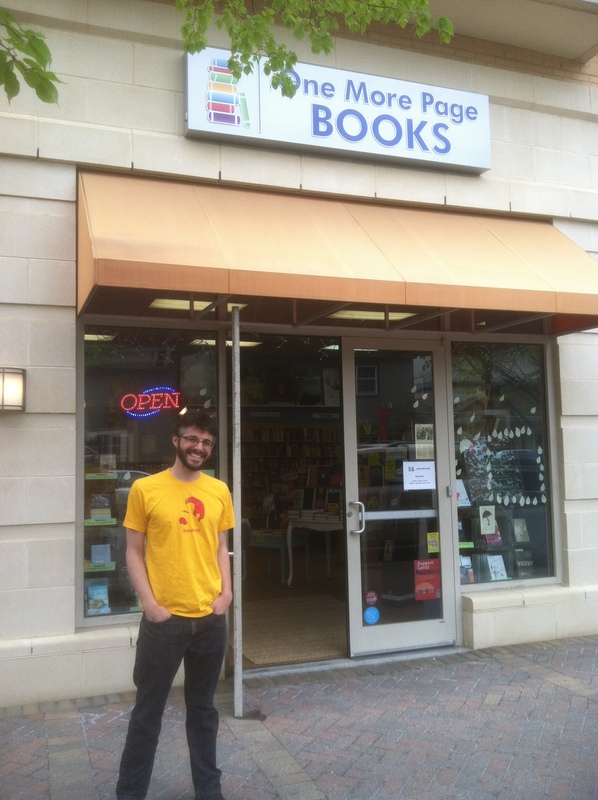 Taking a pit stop at One More Page Books, a cute gnostic nook located in the Arlington/Falls Church area which stresses bringing the community together through books, wine, and chocolate – hard to argue with that! Powell’s Books is one of those book mecca’s every bibliophile will have to visit at least once in their life. It’s like a department store designed by Jorge Luis Borges – a mall which only sells books. 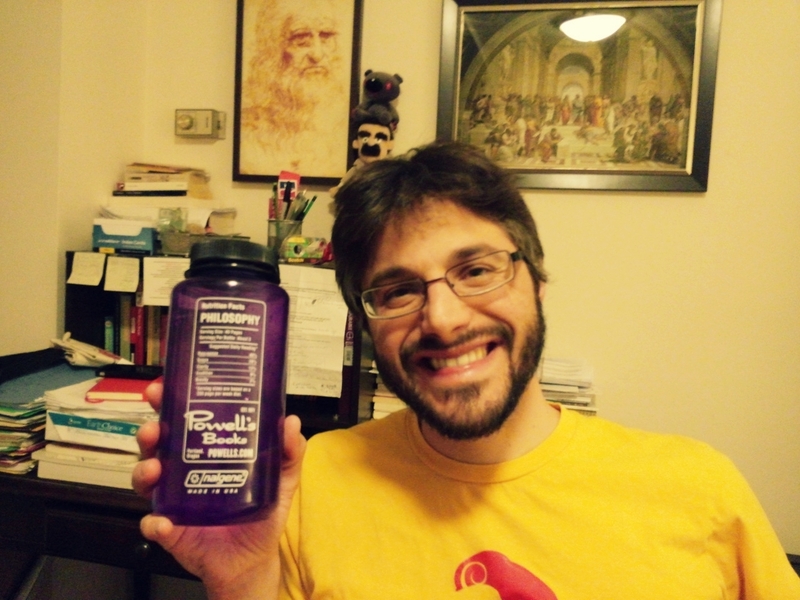 One of my good friends brought me back this thermos after making a pilgrimage to Powell’s. The bottle measures not in liters but in philosophers: Plato apparently being a sip while Foucault is a quaff. If you’re in Portland or buying books online, visit Powell’s!